If youâre shopping at the Gardens Mall between now and Valentineâs Day, donât miss âThe Art of Dr. Seussâ exhibition in the Grand Court. This is the first show of its kind in Florida, and itâs not just for kids. 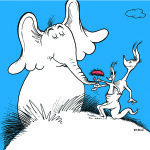 Theodor Seuss Geisel, better known as Dr. Seuss, wasnât just an author. He spent more than 60 years illustrating the imaginary worlds in his stories. Many of those fantastic illustrations, including ones rarely shown in his lifetime, are now on display in an historic collection that demonstrates Seussâ immense talent. âThe Art of Dr. Seussâ offers a glimpse into the artistic life of this celebrated American icon and chronicles more than six decades of work that is uniquely, stylistically and endearingly Seussian. This collection of art has traveled to museums and galleries across three continents since its inception in 1997. Itâs now at the Gardens Mall. 3101 PGA Boulevard, Palm Beach Gardens. Admission is free.